During 2018 and 2019 I am continuing to work in primary schools delivering orienteering activities to pupils using newly-drawn school maps and SI equipment. Yvette Baker Shield - Sign-up now! The introduction of the Yvette Baker Shield for smaller clubs gives all our Juniors a chance to represent AIRE at this Regional Event! The area is ideal for Juniors with numerous paths and rides, little undergrowth and very little public access. It has been used previously for the YBT final. There is plenty of room for Club Tents and Banners adjacent to the finish. This coaching is for junior members of Airienteers or members families and pupils who have tried orienteering at school with our junior development officer. Claro members and friends of Airienteers are welcome if places are available. Great turnout on Sunday, thanks to all the helpers for making the event run smoothly on a beautiful Winter day, Results, routegadget etc. Well done juniors for these great results! Picture of some of the AIRE members who attended a recent club weekend in Coniston. After practising contours and simplification at Dale Park on Saturday we braved the torrential rain to put skills into practice at Holme Fell on Sunday. A challenging photo 'O' game c/o the Parkers kept us occupied during the evening. Thanks Dave Alcock for organising a great weekend! Running the last leg in the sprint relay for GBR at the Junior European Champs, Laura pulled the team up from tenth to sixth and onto the podium. Well done Laura. More details here. 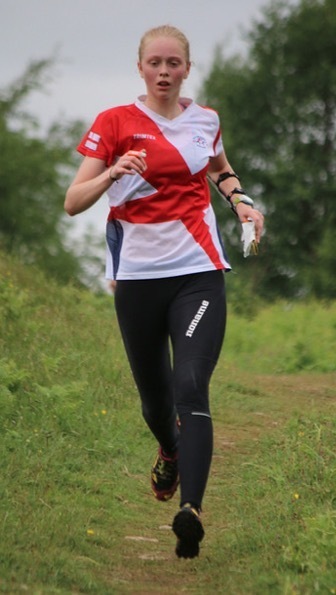 Congratulations and best wishes to Ali McLeod and Alice Leake who have been selected for WOC in Latvia, to Laura King who is going to JWOC in Hungary, Joe Woodley to World Universities and Evie Conway to British start squad training. Ex-AIRE member Hector Haines is also in the WOC team. The club is making a contribution to the juniors' costs. Support for the GB WOC squad is through a crowd funding page at the address below (it works even if you can't see it all). Please contribute if you can. Pride of place this weekend to our wonderful W18 relay team. Lucy, Evie and Laura led throughout to win. In the individual we had no Long course winners, but Laura (W18E), Peter Haines (M60) and Tony Thornley (M65) were all second and Evie Conway (W16) was third. Many thanks to Peter Jones for organising the relay teams. Well done to Evie Conway (W14) for winning the British Schools Championships last month and for her selection to the World Schools Championships in Sicily in 2017. Also congratulations to Laura King and Lucy Haines for being selected for the GB Talent Squad!